Description: medium-sized, 30' — 60' high. Fallen fruit is messy: avoid planting near sidewalks or car parking areas. Attracts various birds: robins, waxwings, cardinals, numerous other songbirds. Description: medium-sized, 25' — 60' high. Produces masses of white or pinkish flowers in spring. Reddish berries in summer. Attracts various birds: robins, waxwings, cardinals, vireos, tanagers, grosbeaks, others. Provides nesting sites for many birds. Description: excellent choice for birds and people. Well-known ornamental, to 40' high. Attractive white, pink, or red flowers in spring Scarlet berries in fall. Attracts various birds: robins, bluebirds, thrushes, catbirds, cardinals, tanagers, grosbeaks, many others. Season: fall fruiting; winter-persistent fruits, with many varieties providing winter-long bird food. Description: medium-sized, attractive spring blossoms. Choose a variety with small fruits (easier for birds to swallow). Food type: flower buds, flowers, fruit, seeds. 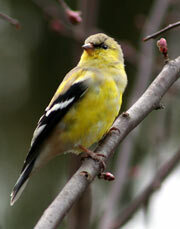 Attracts various birds: robins, bluebirds, thrushes, catbirds, cardinals, waxwings, pine grosbeaks, finches, many others. Provides nesting sites for many birds and additional birding cover. Description: large. Produces acorns every year, unlike other oaks. Attracts various birds: woodpeckers, jays, grouse, wood ducks, and other birds. Also provides nesting sites and additional bird cover. Depending on your geographic location and the plants in your landscape you can expect robins, waxwings, cardinals, vireos, tanagers, grosbeaks, bluebirds, thrushes, catbirds, pine grosbeaks, finches, woodpeckers, jays, grouse, and wood ducks. You will also probably see wrens, chickadees, and sparrows.